I remember years ago when I earned my first Alaskan Cruise with Stampin' Up!. My first reaction was, "I don't think I'll go"!! I know that sounds crazy but since I am a warm weather gal, the thought of being on the water in extremely cold weather made me question whether or not I'd enjoy it. My husband, on the other hand, was VERY excited to go. So, we went. And am I ever glad we did. I found that Alaska was a beautiful place. As we got off the ship in Juneau, Sitka and Ketchikan, all I could think is that I wish we had more time to explore these quaint little towns that were surrounded by extreme beauty. When I earned the 2018 Stampin' Up! incentive trip and it was an Alaskan Cruise once again, we were thrilled to go. This time not just for another opportunity to explore Alaska but to be reacquainted with my demonstrator brothers and sisters whom I love to visit with. I was also excited because I heard that the weather was going to be unusually warm during out trip, something that I didn't mind a bit. We boarded the ship in Seattle, a city that I love! Especially during football season! GO HAWKS!!!! 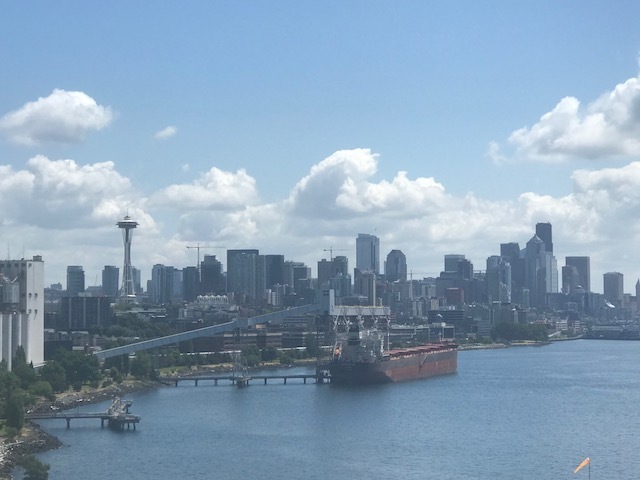 It was fun to view the Seattle skyline as we sailed away to begin our journey. One of the perks of earning an incentive trip is PILLOW GIFTS. Every evening when you come back to your room there are surprises from Stampin' Up!. We received such amazing pillow gifts on this trip. Things such as new catalog product, a gorgeous purse, a blanket, a speaker with the SU logo on it and on the first night this stylish grey jacket to keep us warm all week. Pillow Gifts are the best! Of course another one of the major perks is being the first to see the new Holiday Catalog. It was fun to read it while relaxing on our private deck. It's A New Holiday Catalog!!! While we were cruising we only have a few "official" gatherings, otherwise we get to plan to spend our days however we like. It's a true vacation! On day one, we did have a gathering where they announced where our next incentive trip will be. They made the announcement in a creative way with demonstrators holding suitcases that were lined up across the stage. Each suitcase had a "clue" inside. One suitcase contained a hat, then a pair of rubber slippers, then an aloha shirt!!!! Get the picture?????? Any guesses??????? I had a feeling and I was right! It was revealed that we are going to Maui in 2020! So many people on the ship asked me if I was excited about that? There's a small part of me that would have preferred to go somewhere I haven't been before. However, I love Maui and the Grand Wailea is awesome! I will love the 20 minute flight and it will be great having so many friends coming to my home state!!! I will definitely work hard to earn it because no matter where they are, Stampin' Up! Incentive trips are the best! So let me tell you a little bit about the places we visited on this trip. One of our first stops was in Junea where went on a hike. I asked our friends, Bruce and Lynsay, "do you think I'll need to dress warm for the hike?". Knowing that we would be climbing up to a high elevation and knowing how cold I get, they said, "YES"!!! What we all didn't know is that it was SUPER HOT, even at the higher elevation!!! It was so hot that just minutes after this photo was taken and the guy who took the photo left, I went behind that platform to remove some layers of clothing!!! Even though it was warm, we enjoyed the views all the way up the mountain. Do you see our cruise ship down there? We didn't get to climb as high up as we had hoped to because we ran out of water! However, we did manage to find some SNOW! It was a great place to cool down and enjoy the views! And what a view it was!!! Climbing down is always my favorite part. At the foot of the trail, we saw this beautiful Eagle. We took the tram down the mountain and went searching for Bubble Tea. We did find Bubble Tea but there is no photo because it was the worst tea I have ever had in my life. Who wants WARM bubble tea, with no flavor, and no ice on a very hot day??? Not me!!! We did however find some shops and Lynsay bought a cute sweatshirt in one of the shops that said, "Juneau, What I'm Saying". If I had to pick a "favorite" day it was the next day when we went to Skagway. 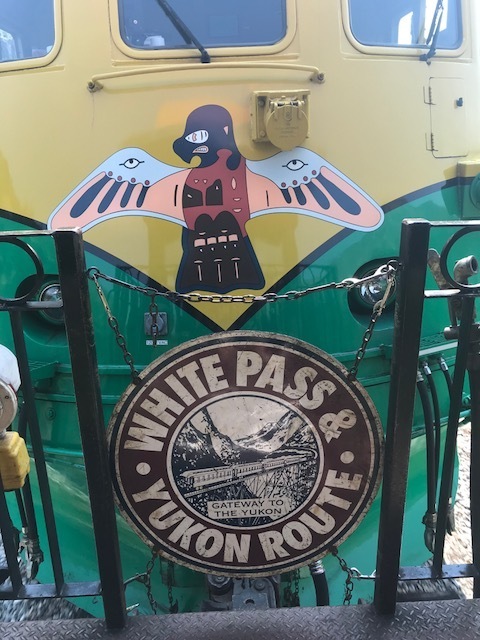 My good friend Meg coordinated a fun Yukon Rail Excursion there. This day provided us with lots of time to visit with each other while enjoying many really beautiful places. And guess what happened on this day???? Well, yes, he is stuffed!!! However, an hour or so later, we saw another one!!! This one was alive and well. He put on quite a show for us while eating his lunch. We enjoyed watching him from inside of the van we were riding in. Later in the day we got to play with sled dogs! Ahhhhhhhh, they were so cute!!! I wish I could have brought one home! Just look at that face!!! I think the highlight of the day by far was this moment when we stopped at this beautiful Emerald Lake, just north of Carcross. It provided us with the perfect opportunity to take this ultimate Bru-mance photo. These two are so funny!!!! We rode the Yukon train back to town! It was a lot of fun! I got to spend a lot of quality time with my friend Genevieve this day. Every time I talk with her I walk away feeling so uplifted and encouraged. Our final port was Victoria, B.C. I had been here once before but our time was limited. We had a full day there this time! We got to eat at a wonderful Italian restaurant, visit a museum and enjoy shopping. I loved all the beautiful flowers we saw, epecially these leading up to the Empress Hotel. It was another warm, beautiful and sunny day. Just look at the gorgeous colors! Makes me want to go stamp something with Melon Mambo Ink or does this look more like Berry Burst or Rich Razzleberry to you? We did manage to find an excellent place for Bubble Tea! Yum! This tea from The Bubble Tea Place was VERY good, picture worthy! Although we went to wonderful places, enjoyed fun sea days, received amazing pillow gifts and ate and ate and ate, the highlight of these trips is always the people I get to see and spend time with. It was so good to see Kim, pictured below with her kids. Kim and I served together on the Stampin' Up! advisory board in 2003. Although we live thousands of miles a part, we talk to each other several times a week. I see Kim at SU events but I hadn't seen her kids in awhile. Oh boy, have they grown up! Kim has done an amazing job keeping our Advisory Board Group together. It is so wonderful to be reunited again! Love all the smiles and hugs shared that day! I learned a long time ago that if I ever needed anything, I could turn to these ladies for encouragement and support. We share a special sisterhood together! One of my favorite parts about cruising is going to dinner at night. It's always a great time to spend quality time with friends and share about your day. Plus since you're on a cruise you are forced to eat one dessert and sometimes two every night. We enjoyed the opportunity to meet new friends as well! 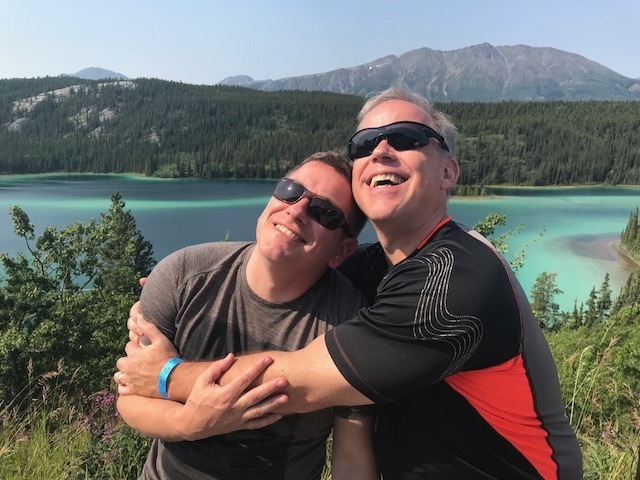 I'm so grateful Derek was able to take a break from a busy season at work to join me on this Alaskan Adventure. Thank you so much from the bottom of my heart to all of you who support my Stampin' Up! business! If it weren't for you inviting me into your homes to do classes, attending my events and ordering from me online, I wouldn't have the opportunity earn these trips and fulfill one of my passions, which is to travel. I am grateful that God has blessed me not only with such amazing customers and downline members but with the ability to work for a company that gives me the opportunity to earn incentive trips such as this. I've already qualified for the 2019 trip. Next summer we'll be heading to GREECE! I am super excited about that! It's because Stampin' Up! Incentive trips are truly amazing experiences and after seeing these photos I'm sure "Juneau, what I'm saying"!!! I hope you enjoyed experiencing a little bit of my Alaskan Adventure! Until next time, have a blessed day!